Please scroll down and click on the "buy" button for the amount of time you wish to take. 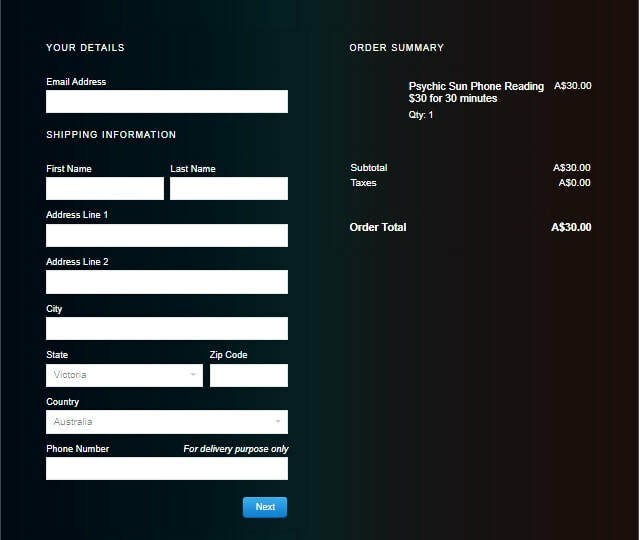 The "secure checkout" page will appear, you will need to fill in all the details on that page and click "next". You will then be asked to "review" your details in a second "secure checkout" page, please do so, ensure all your details are correct and click "next". You will then be taken to a PayPal login page where you can choose to login and make payment via your PayPal account or you can click the "Pay by Card " underneath the paypal login which will take you through to a PayPal credit card facility. 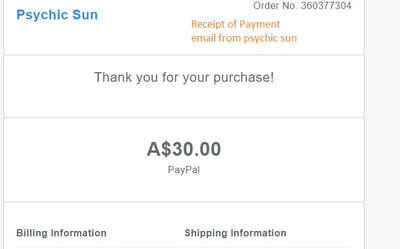 You will receive two emails of your payment, one from Paypal and one from "Psychic Sun" but you have only paid once. 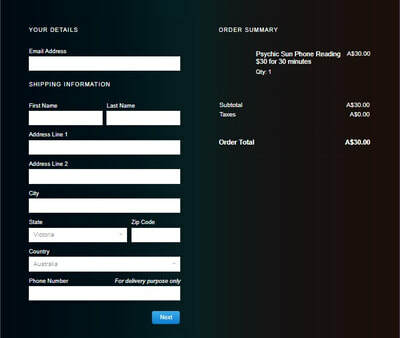 ​ Pic No 6 and 7 show examples of the payments receipts you should receive. 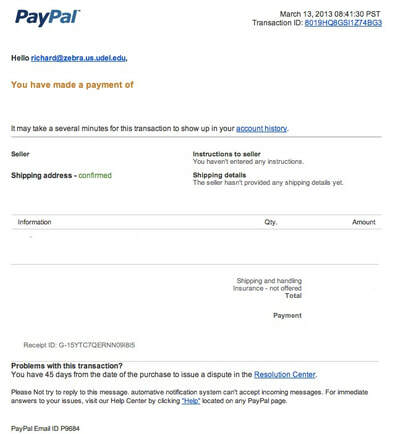 Please understand the pictures below are just examples of how to make a payment, you cannot make a payment from them, you will need to scroll further down the page to the actual "buy now " buttons. 2. 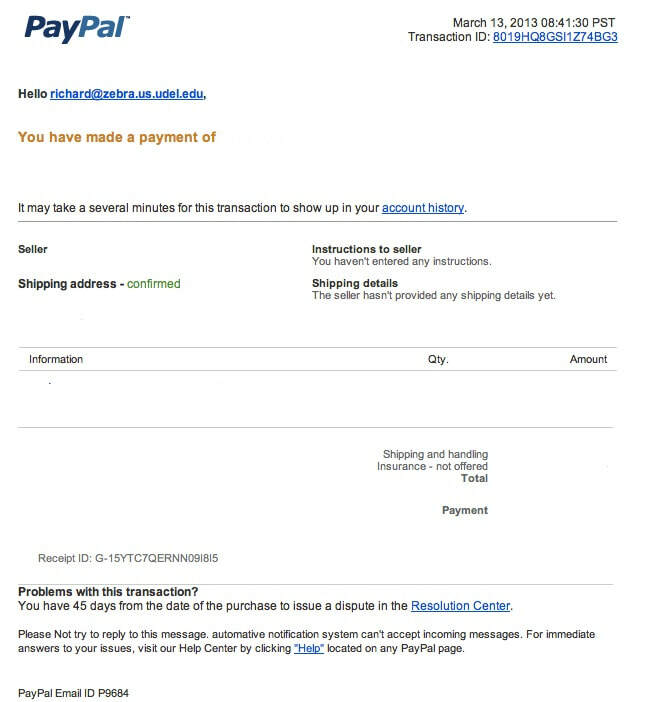 You are welcome to use your "Send Money" option in your PayPal account if you so wish to using my email address psychicsun7@gmail.com. PLEASE NOTE: You are welcome to pay with a PayPal Echeque but please be aware I will not do the phone reading until the Echeque has cleared and this does take 5 days, you will have to wait and make an appointment after the Echeque has cleared. This is on advisement from PayPal that no seller should provide goods and services until an Echeque has cleared. Please see bank details below for a direct deposit payment. 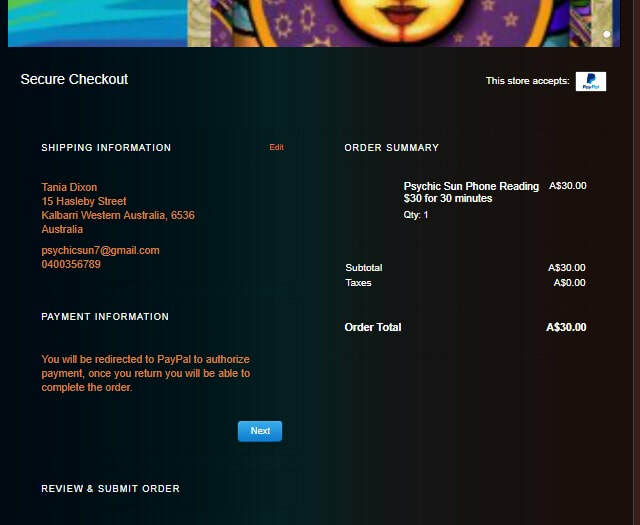 If you choose this payment method, you MUST send me a receipt number and description of payment to email address psychicsun7@gmail.com or a screenshot of payment after making the payment so I can confirm your booking. Failing to do so can cause your booking to be cancelled and postponed until the payment has cleared. I have no receipt or way of knowing if you have paid otherwise. IF YOU BOOK PLEASE PAY IMMEDIATELY, YOU WILL FIND YOUR BOOKING CANCELLED IF YOU LEAVE YOUR BOOKING UNPAID FOR ANY MORE THAN ONE HOUR. 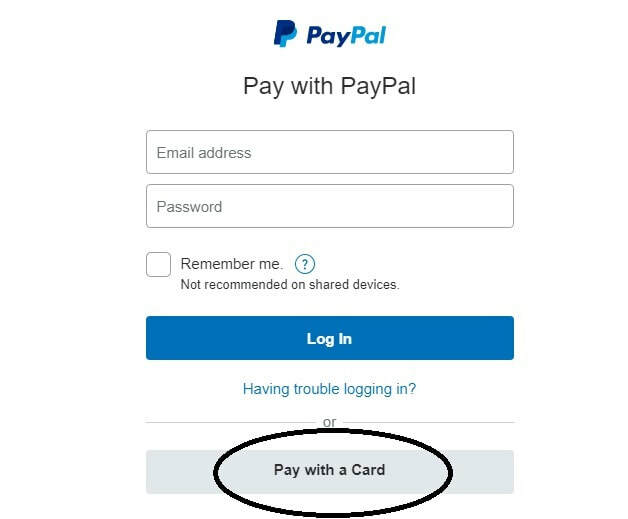 IT IS YOUR RESPONSIBILITY TO CHECK YOUR EMAILS AND ENSURE YOU HAVE THE EMAIL FOR YOUR BOOKING AND TWO EMAILS FOR YOUR PAYMENT IF YOU HAVE PAID THROUGH PAYPAL. 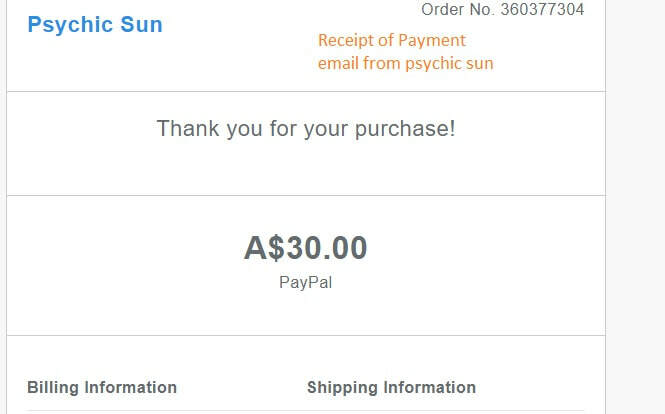 ONE RECEIPT FROM PSYCHIC SUN AND ONE RECEIPT FROM PAYPAL, TWO RECEIPTS FOR ONE PAYMENT. ENSURE YOU SEND ME A SCREENSHOT OF PAYMENT OR RECEIPT DETAILS TO PSYCHICSUN7@GMAIL.COM IF YOU CHOOSE BANK DEPOSIT, FAILING TO DO SO WILL CREATE A CANCELLED BOOKING.